Pictured: Premier of the Turks and Caicos Islands, The Honourable Sharlene Cartwright-Robinson. Bridgetown, BARBADOS, 10th January 2017: Given the existing contribution of the outsourcing sector to job creation in the Caribbean region, coupled with its potential for expansion, calls are being made for greater levels of priority to be given to the outsourcing sector. Executive Director of the Caribbean Export Development Agency Pamela Coke-Hamilton said more needs to be done by regional governments in seeking to position the Caribbean for the trending opportunities in the business outsourcing industry. Ms. Coke-Hamilton made the plea as she addressed the opening session of the inaugural staging of the Outsource to the Caribbean Conference (OCC) sponsored by itelbpo, under the theme “Leveraging the Nearshore Caribbean for Outsourcing Services”, on December 6, 2017. The conference was held at the Iberostar Rose Hall Beach Hotel in Montego Bay, Jamaica, where representatives from over 26 countries gathered to discuss how best to attract more business from international companies to the Caribbean in areas such as call centre operations, website and animation design and legal and accounting services. Pointing to the outsourcing sector’s existing contribution to job creation in the region and its potential for expansion, Ms. Coke-Hamilton highlighted that an average of 5,000 workers were being added to the BPO sector annually. “In 2010, the sector provided employment for 47,000 workers and by 2015, this number had increased to 74,000... BPO and other professional services generated over US$2 billion in revenue in 2014. Calculations show that companies in the region generate close to US$25 million in revenue for every 1,000 agents”, said Ms. Coke Hamilton. According to the Caribbean Export Development Agency’s Executive Director, outsourcing investors are working overtime to expand their services in the Caribbean, despite the region being late comers to the business of outsourcing. “The Caribbean is a late comer to this industry but besides our educated, multi-lingual, customer focused talent pool - we have several other qualities needed to make this sector a resounding success story for the region,” contended Ms Coke-Hamilton. Drawing reference to an outsourcing sector investor perception survey recently conducted by her organization, Ms. Coke-Hamilton pointed out that investors perceived the Caribbean as a strategic or ideal location for outsourcing, “as we provide time zone proximity and low operating costs to investors, as a nearshore destination, we are within a similar time zone as New York, with daily flights from key markets…from Miami, we are 45 minutes to our nearest destination and up to 3 hours to our furthest”, she told the investors. The survey also highlighted that 45% of investors indicated that their future business plans entails expanding within the Caribbean in the next 12-24 months. “This is amazing news for the region and it means that those outsourcing firms who are here are experiencing success and want more. In making their investment decisions our respondents have noted that this forms part of a regional strategy. This is a significant motivation for us at Caribbean Export to support the promotion of the Caribbean for investments given that investors are looking regionally. They are not thinking of setting up only in one territory but several’, said Ms Coke-Hamilton. Another interesting find of the survey is that 100% of investors have indicated that they will be employing additional talent in the next 12-24 months, and they will be looking to the Caribbean for this labour, given the human capital assets of communication skills, ability to learn quickly and the professional nature of the Caribbean’s talent pool. According to Ms. Coke-Hamilton the survey also highlighted developmental issues for the Caribbean including the need to be more creative in its incentive packaging, additional training for its people and the need to provide more data or market research on the sector. Also speaking at the opening session was Jamaica’s Finance Minister Audley Shaw who indicated that some 26,000 persons are currently employed in the industry across the island with some 60 companies of varying sizes operating from its shores. He stated that one aspect of his government’s response to the requirements of the BPO industry is to ensure that its people are trained and equipped with the necessary skill sets to meet the demands of investors. “There is now the drive to diversify the local industry and move Jamaica up the value chain by delving deeper into new areas such as Shared Services, Legal Process Outsourcing, Computer Aided Design and Medical Process Outsourcing. These areas will present new challenges including the language barrier. We must equip our workers and position ourselves to leverage all the investment we can”, said Minister Shaw. He further added that the geographical spread of investors within the BPO industry is an area the government has taken note of. He pointed out that the Factories Corporation of Jamaica has been tasked with providing real estate solutions for a variety of industries, including the BPO sector. He said some 365,000 square feet of the Morant Bay Urban Centre and 750,000 square feet of the Naggo Head Technology Park will see spaces developed for the BPO sector. 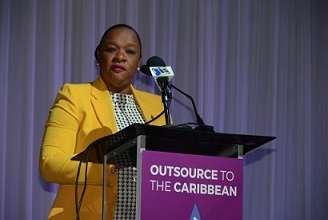 Other notable speakers at this first ever Outsourcing conference in the Caribbean was Premier of the Turks and Caicos Islands, The Honourable Sharlene Cartwright-Robinson. She implored upon investors that if customer retention was their goal, then the Caribbean is the place to do business. “In the Outsourcing Sector retaining talent is often a challenge, in the Caribbean, BPO’s service providers can boost attrition rates as low as 3% in Suriname and 5% in Haiti, which further supports the Caribbean’s case compare to other major outsourcing markets like India at 40% or Mexico at 25%.